First things first: I own a 2007 Mazda3, and Dave (Chief Editor at Go Ahead Take the Wheel) races an ITA Miata. So we get the whole Zoom-Zoom concept. Mazda defines it as exhilaration and liberation from experiencing the emotion of motion. 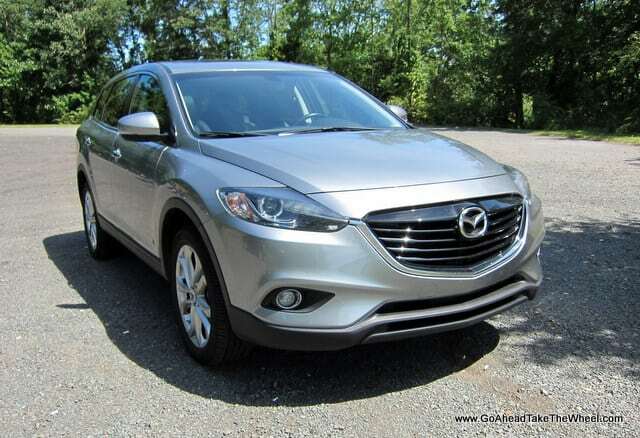 But both our vehicles are lightweights in comparison to the Mazda CX-9 (Mazda3 = 2,780 lbs vs. CX-9 = 4,552 lbs). Actually, the CX-9 is probably similar in weight to both my Mazda3 and Dave’s Miata combined (give or take). The CX-9 is actually the largest vehicle in Mazda’s lineup. You would think that there’s no way a seven passenger SUV would be all that entertaining to drive on the road. You’d be wrong! In fact, it’s actually pretty darn fun to drive for a 4,500 pound vehicle! No, it’s not in the same league as Dave’s race prepped Miata, or even my Mazda3, but drives like a vehicle much lighter than it is. The CX-9 was launched in 2007 and is currently one of the oldest vehicles in its segment, meaning that almost all other comparable vehicles have been introduced or redesigned since then. To remain current, Mazda refreshed the CX-9 for 2013. They updated the front with Mazda’s KODO “Soul of Motion” design, as well as added some technology features. However, there are no major mechanical changes. Thankfully they left the Zoom-Zoom driving experience alone. Our CX-9 is the top of the line Grand Touring with All-Wheel Drive. 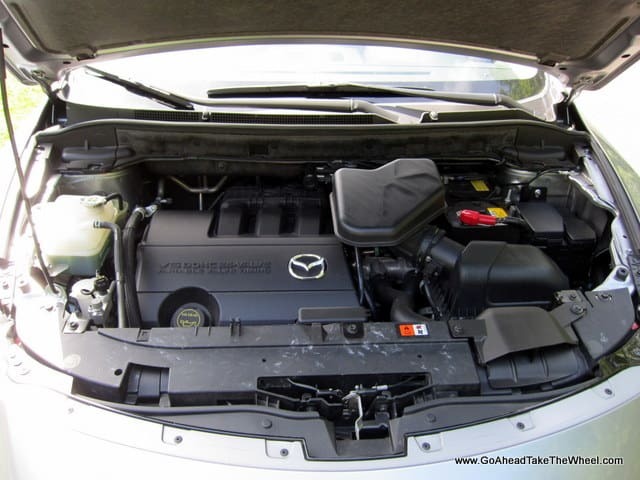 While most other Mazda vehicles are receiving the SKYACTIVE technology treatment, designed to enhance fuel economy without hurting performance, the CX-9 continues to be powered by the same MZR 3.7-liter V-6 engine as before. This is a good thing in a way because it’s refined, delivers plenty of punch in normal driving situations, and is well matched for this vehicle. Peak power is 273 horsepower at 6,250 rpm. Peak torque is 270 lb.-ft. at 4,250 rpm, but keeps at 250 lb.-ft. between 3,000 to 6,000 rpm. We measured 0-60 mph in 8.0 seconds. This number doesn’t sound fast, but for some reason it feels much quicker than the numbers imply. Acceleration feels potent throughout the entire rev range and feels strongest once you hit 3,000 rpm all the way up to its 6,500 rpm redline. The engine remains smooth and composed though the whole process. Also, since our CX-9 is all-wheel-drive, we exhibited no wheel spin, and we expect similar results in most driving conditions. The CX-9’s AWD system delivers all the power to the front wheels until slip is detected. At that point, it can send up to 50% of torque to the rear wheels. We’ve heard some noise that the CX-9’s EPA MPG estimates lag behind most of its competitors. While this is true, it’s probably made out to be a bigger deal that it really is. For example, the MPG in the CX-9 (city/highway/combined) is 16/22/18. By comparison, the 2013 Toyota Highlander 4WD 3.5L V-6 is 17/22/19, the 2013 Dodge Durango 3.6L Pentastar V-6 is 16/23/19, and the Chevy Traverse AWD is 16/23/19. The CX-9 gives up 1 MPG combined. According to EPA estimates, this amounts to approximately $150/year. This is not a big deal to us considering the added enjoyment we get out of driving the CX-9. Also, the CX-9 runs on regular unleaded as opposed to premium which helps. 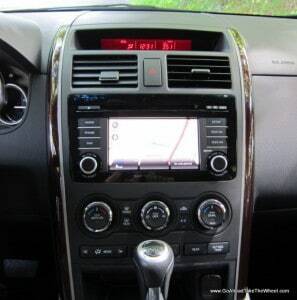 The transmission is a 6-speed Sport automatic with a manual mode. The top two gears are both overdrive ratios. It shifts both smoothly and fairly quickly. A manual transmission is not available. Under routine driving, handling is sprightly and well controlled, just as you’d expect from a nameplate that’s marketed with a Zoom-Zoom tag line. Brakes are ventilated and feel pretty strong with linear stops and good brake feel. 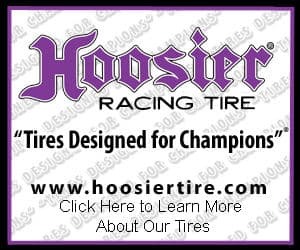 Under very aggressive driving, the tires had a difficult time managing the vehicles mass and were the first things to let you know you’ve reached the vehicle’s limits. The ride is taught (but not harsh), and is not jiggly or floaty. There is some tire noise that makes its way into the cabin, but it’s not too loud. A small amount of wind noise also makes its way into the cabin at highway speeds. This is not bothersome either. Steering has a little bit of weight that’s felt more at lower speeds. Maneuverability is quite good in parking lots considering the size of this vehicle, but you’re always aware you have two other rows of seats behind you. It’s turning circle is just over 37 feet in diameter. You’d be hard-pressed to find a Mazda CX-9 on a racetrack, but since Mazda buyers typically care about the performance of their vehicles, the popularity of this vehicle has created a demand for even more performance. If you want to further enhance the performance of your CX-9 at a fraction of the cost of a new high-performance German SUV, there are various suppliers out there that sell performance enhancement products. Aftermarket performance enhancing items available for the CX-9 include chips, air intakes, superchargers, turbochargers, exhausts and more. Be careful though as to not jeopardize the manufacturer’s warranty in the process. As part of the 2013 refresh, the CX-9 benefits from the KODO “Soul of Motion” (even when standing still) styling enhancements. We say “benefits” because the styling is more fluid, is more attractive (in our eyes), and is less forgettable than the 2012 model. It’s definitely one of the sportiest looking SUVs on the market today. Up front, updates include reworked front headlamps, grille, and bumper. The fog lights also have been restyled, changing from a trapezoidal shape to a round shape. 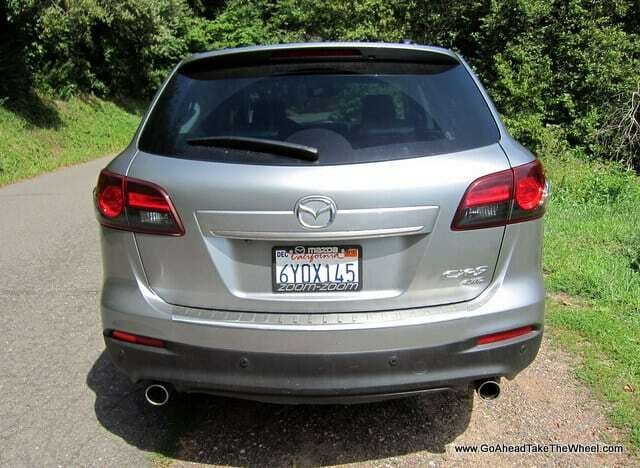 In the rear, Mazda reworked the rear: bumper, taillights, and exhaust design. Under the wide front fender arches our CX-9 was equipped with the newly optional for 2013 20-inch aluminum alloy wheels with a satin chrome finish and Bridgestone Dueler H/L 400 P245/50R20 all-season tires. The interior is roomy, with a premium appearance, although there are hard plastics that simulate the appearance of grained leather in places that you don’t normally touch like the dashboard and A-pillars. 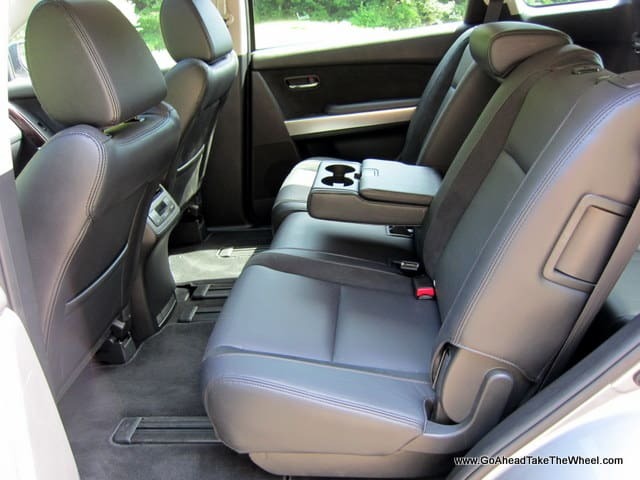 All the places you do touch that you expect a soft feel are, especially the arm rest on the center storage console. The three-spoke leather-wrapped steering wheel tilts and telescopes, as well as offers controls for cruise control, audio and hands-free phone. The 8-way adjustable front seats are covered in black leather upholstery, and trimmed with black suede inserts on the side bolsters. The seats are very comfortable, but Dave experienced discomfort on his back from the stitching area in the upper part of the side boslters. The 60/40 split second row seats accommodate three passengers (two pretty comfortably as the middle is not as comfortable as the sides). The seats can travel several inches fore and aft, as well as recline. The track that the second row seating slides on is quite visible and is prone do collect dirt, and whatever items that fall in there, much of which will be difficult to remove. The third row is split 50/50 and can fit two. Legroom is dependent on the position of the second row seats and can be suitable for children as well as smaller sized adults for short trips. Because the floor is high, with the second row all the way in the aft position, third row occupant’s knees will ride up against the second row seats. Access to the third row is facilitated by a second row that easily moves forward, creating approximately 26 inches of space to enter between the second row and the C-pillar. 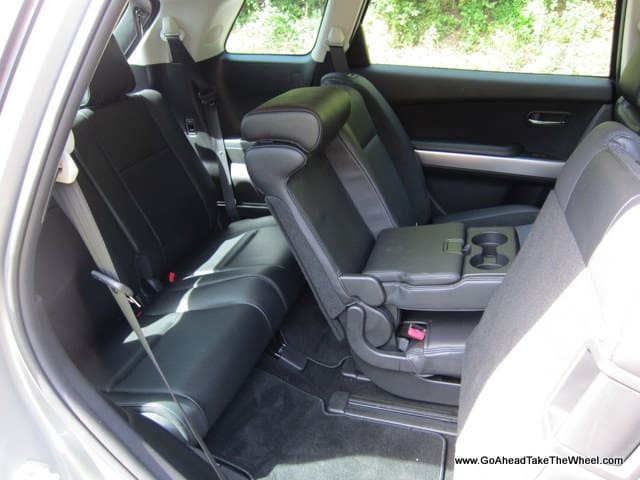 If you have two child seats installed in the second row, access to the third row is significantly more difficult, and both the front seat and second row seat will have to be moved forward to create sufficient room for passengers to access the third row. is a 5.8-inch multi-information display (MID) screen with subscription based HD Radio and Pandora. MP3 players and smartphones can be connected via the Bluetooth® hands-free phone and audio system. I was able to pair my smartphone to the CX-9 and play Pandora music through the premium 11-speaker Bose® Centerpoint® Surround Sound System. I was pretty impressed with the sound of it since it’s worlds better than the premium Bose system in my Mazda3. There is also a USB connection port as an alternative for users who do not want to connect their devices via Bluetooth and an auxiliary jack. Visibility is good all around. The rear camera is helpful when you’re backing up. Once you put it in reverse, the side mirrors can tilt downward to assist in parking. This was helpful some of the time, but other times it would activate in times when it wasn’t needed so we just turned it off. The power liftgate can be open from inside the vehicle, from a handle on the liftgate or by pressing a button on the key fob. It lifts to around 6 feet in height. I’m 6’1, so it’s just out of my line of sight. As a result, I bumped my head on it several times. Unfortunately maximum lift height is not adjustable. With the third row seats occupied, Mazda says the CX-9 provides 17.2 feet of cargo space, which eclipses many large sedans. However, this number is deceiving since the actual amount of floor space is small by comparison and real world storage is significantly less. There’s really just enough room for a few bags of groceries. However, with the second and third row seats folded flat, the CX-9 provides up to 100.7 cubic feet of storage. This is a lot of space, but is less than some of its less fun-to-drive competitors. 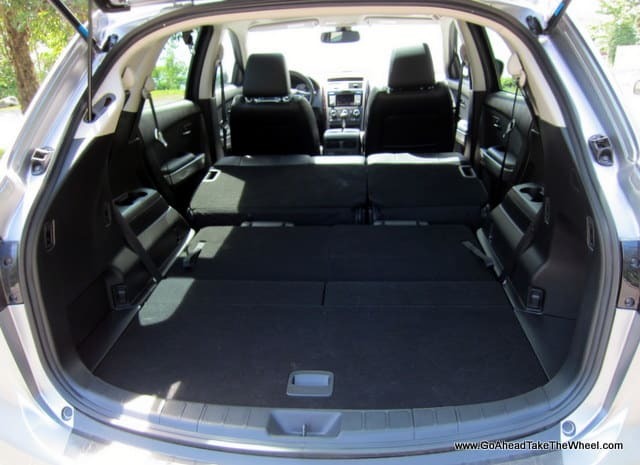 Additional storage includes a glove compartment, center storage console, 10 cup-holders, storage pockets in each door, and a storage space under the floor behind the third row seats. The temporary spare tire is underneath the SUV. The CX-9 is arguably the best “affordable” driver’s three-row SUV out there. It has the driving feel and fun factor of vehicles from other manufacturers costing significantly more. Overall, it’s made with a high level of quality that doesn’t feel cheap. It’s not as spacious as some of its main competitors, it’s not the newest design, or most fuel efficient in its class, but if you enjoy driving a vehicle with sporty handling, and a great powertrain, but need room for seven, than the CX-9 should be on your short list and is definitely worth a test drive.